Designed for girls and women who love being active in and around the water! These long leggings have a broad waistband and full coverage. The legging includes a drawstring around the hips to tighten up. Made for surfing, yoga and working out! Our tip: combine this CURMS Legging with the Happykini Sport Top. The CURMS Legging comes in different colour combinations of a traditional ikat print combined with a plain matte colour. 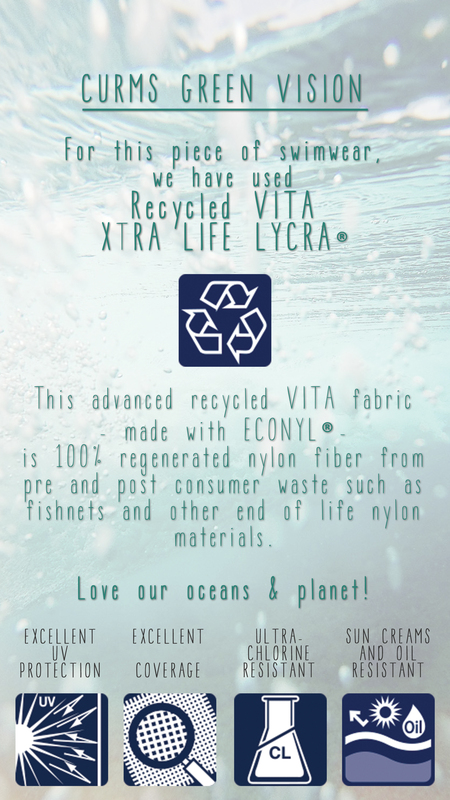 This advanced recycled VITA fabric – made with ECONYL® – is 100% regenerated nylon fiber from pre and post consumer waste, such as fishnets and other end of life nylon materials. Love our oceans & planet! For many generations the Indonesian people produce ‘ikat’, a very complex woven fabric that is highly valued in Indonesian society. This literal piece of art once was used for marital exchange and to define the networks of social relationships. We have selected this traditional ikat cloth to process the beauty of the antique textile in our one pieces and printed this motif on high quality recycled nylon/spandex. Each Legging is hand printed and the handcrafted touch of artisan skill creates variations in colour and design. Flores is a big island in Eastern Indonesia. The ikat pattern we’ve selected for your product is originally from Sikka-district in East Flores. The Sikka people produce very complex fabrics for exchange in marriage and to define the network of social relationships. Note: Colour differences may occur between this product and your screen. By buying CURMS Swimwear you support the local handwork artists, from weaving lady to seamstress, in Indonesia! Good care will extend the life of your CURMS Legging. Rinse and line dry for best results after every use. For this piece of swimwear, we have used Recycled VITA XTRA LIFE LYCRA® This advanced recycled VITA fabric - made with ECONYL® - is 100% regenerated nylon fiber from pre and post consumer waste, such as fishnets and other end of life nylon materials. Designed for girls and women who love being active in and around the water! Made of 80% nylon and 20% spandex. Designed for girls and women who love being active in and around the water. These long leggings have a broad waistband and full coverage. The legging includes a drawstring around the hips to tighten up. Made for surfing, yoga and working out! Our tip: combine this CURMS Legging with the Happykini Crop Top. The CURMS Legging comes in different colour combinations of a traditional ikat print combined with a plain matte colour. Made of 80% nylon and 20% spandex.